Mexico City (CNN) — A strong earthquake damaged hundreds of homes in southern Mexico Tuesday and rattled residents hundreds of miles away in the nation’s capital. 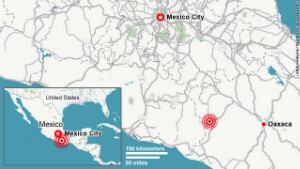 The quake had a magnitude of 7.4, according to the U.S. Geological Survey, and its epicenter was about 15 miles (25 kilometers) east of Ometepec, Guerrero. 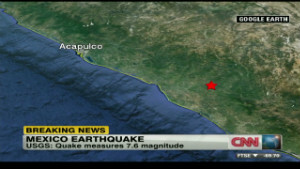 Mexican authorities reported the magnitude of the quake as 7.8. At least 500 homes in the southern coastal state were damaged, Gov. Angel Aguirre told reporters. 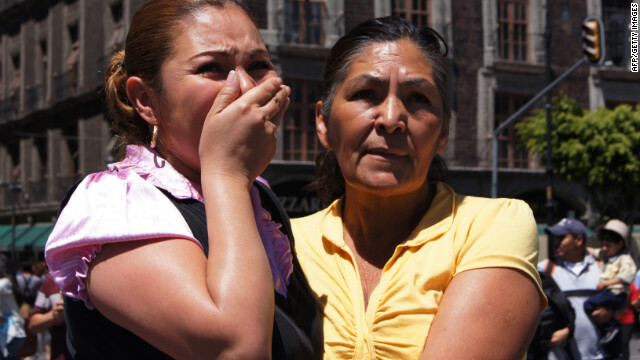 The temblor injured at least 11 people, Mexican Interior Minister Alejandro Poire told reporters. Nine of the injuries occurred in Oaxaca state, which borders Guerrero and also suffered damage from the quake, he said. 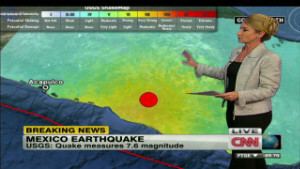 Two people were injured in Mexico City, about 200 miles (320 km) from the quake’s epicenter. 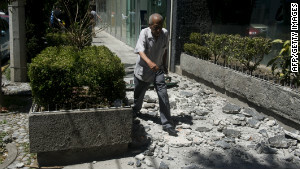 Guerrero residents felt aftershocks hours after the quake, which the USGS said had a depth of about 12.4 miles (20 km). “There are many cracked ceilings, many houses that collapsed,” Francisca Villalva Davila, Ometepec’s comptroller, told CNN en Español. Authorities were still surveying damage Tuesday evening, Poire said. Reports differed about the earthquake’s impact. Officials reported that at least 800 houses had collapsed in the town of Igualapa, the Guerrero state government said in a statement. Later Tuesday, the head of Guerrero’s civil protection department said officials had confirmed 200 damaged homes in the town. That number could increase when assessments of the area continue Wednesday, he said. Residents rushed into the streets after feeling the temblor in Mexico City. Tourists and residents also felt the earthquake in the resort city of Acapulco, located about 100 miles (200 km) from the quake’s epicenter. Calderon said that there were no immediate reports of serious damage, and that the nation’s health system was operating normally. “There are some broken windows, much fear, much panic,” he said. The USGS initially reported the magnitude of the quake at 7.9, but later revised that figure downward to 7.4. Multiple houses collapsed in the Ometepec area, Aguirre told CNN affiliate Televisa. Government helicopters were surveying the area, he said, and officials were preparing shelters for displaced residents. 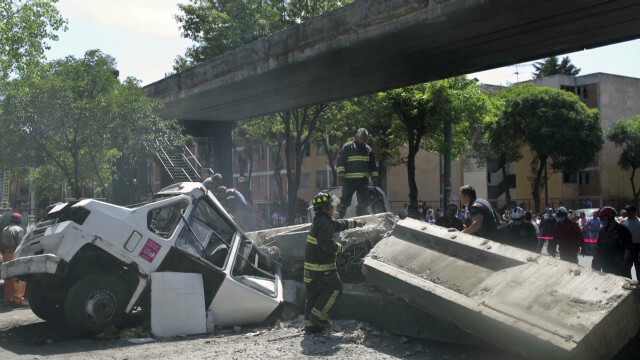 One person was injured when a pedestrian bridge fell on a minibus during the quake, he said. Earthquakes are a frightening experience for the more than 20 million residents who live in the sprawling metropolis, where about 10,000 people perished after a massive quake in 1985. A spokeswoman told reporters that U.S. President Barack Obama’s eldest daughter, who was on a spring trip with classmates in Mexico about 100 miles away from the quake’s epicenter, was not injured. “In light of today’s earthquake, we can confirm that Malia Obama is safe and was never in danger,” said Kristina Schake, a spokeswoman for first lady Michelle Obama.